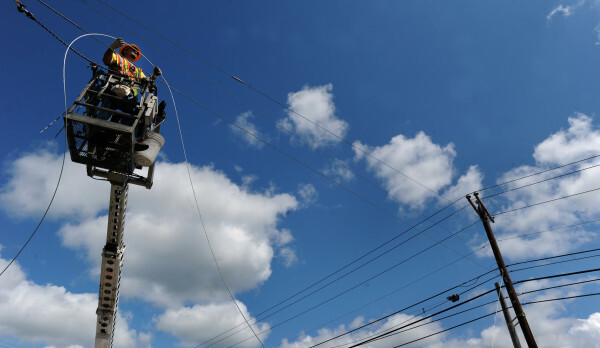 Scott Cornforth a foreman with NextGen installs a guy wire on a utility pole while his crew was lashing fiber-optic cable along the River Road in Bucksport as part of the "Three Ring Binder" project in this 2011 BDN file photo. PORTLAND, Maine — At Maine’s State House and in pioneering communities around the state, 2015 could be the year of broadband. President Barack Obama has thrown support behind expanding broadband and regulators are considering treating it as a utility like electricity. Some of the legislative proposals take measures that Phil Lindley, head of the ConnectME Authority, said reflect a new level of interest. Three bill titles involve a bond for broadband capacity while others will look to fight for space aboard the final version of the two-year budget LePage unveiled last week. The budget did not include funds for broadband expansion. That comes after various reports of Maine lagging behind other states in broadband speed, though measures can vary widely from one area to another. On a statewide average, the NetIndex from the broadband speed testing company Ookla, Maine is ranked 50th in the country with a download speed at about half the national average, at 16.6 megabits per second, in January. Freshman lawmaker Rep. Norman Higgins, a Republican from Dover-Foxcroft, has put forward a number of bills to improve broadband service in Maine, saying he thinks broadband infrastructure warrants state investment as a way to improve the future of the state’s rural economies. He proposes allocating millions of dollars to expand the availability of grants to municipalities that want to build and own high-speed fiber-optic networks that would be open to companies that want to serve businesses and homes, similar to the model pursued by Rockport, South Portland, Orono and Old Town. Higgins’ bill and those of lawmakers on both sides of the aisle have a long way to go before becoming law, but the issue has momentum with a wide range of constituencies with broadband-related bill titles filed by 26 legislators. The board of the Maine Farm Bureau in November voted to make the issue one of its top priorities, advocating for a five-fold increase in the ConnectME Authority’s annual budget for “last mile” projects that connect homes and businesses to high-speed connections. Timothy Schneider, public advocate with the Maine’s Public Utilities Commission, said he has spoken with a number of Republican and Democratic lawmakers on bills related to broadband service. And on Dec. 30, LePage sent a letter to ConnectME Authority chairwoman Jean Wilson, urging the state to raise its definition of areas “underserved” by broadband providers as those who can’t get access to connections that would allow them to simultaneously upload and download about 1.1 megabytes per second. “It has become increasingly evident that many industries simply cannot prosper in our state without this service,” LePage wrote. The authority’s board will vote on that new standard Friday, which would for the first time set standards for uploading, and at levels higher than thresholds set by federal government and most other states. In exact terms, the proposal is for 10 megabits per second for uploads and downloads. In shorthand, that’s 10 megabits symmetrical, or 10 up and 10 down. The standard, set every year, is now 1.5 megabits per second for downloads. If the new standard is enacted, Lindley said it would be a factor for projects applying for the about $750,000 in grants the authority will release in 2015, but such higher-speed projects would not then take precedent over those in areas with only dial-up service. Lindley said the upload requirement provides a better measure of how well a given broadband connection will be at serving business customers who aren’t just streaming video from Netflix but also uploading large amounts of information. “The aspiration level of 10-10 is going to have less short-term impact on the homeowner and more on small businesses,” Lindley said. Some towns, like Orono, are already pursuing speeds like that and faster as ways to attract businesses. And, in doing so, they stand to inform lawmakers about what’s needed to bridge the connection between the large-scale Three Ring Binder fiber-optic network running through most of the state and the end user. Orono’s assistant town manager Belle Ryder said the way to think about it to compare broadband infrastructure to the state’s road system. The Three Ring Binder, or “middle mile,” is like state roads while the “last mile” connections are like local roads. Ryder spoke to about 60 lawmakers Wednesday during the Maine Development Foundation’s Public Leaders Academy about Orono’s plans for a high-speed municipal fiber-optic network. Correction: An earlier version of this story misspelled Belle Ryder’s name and incorrectly stated Rep. Norman Higgins lives in Milo, a town in his district. He lives in Dover-Foxcroft.